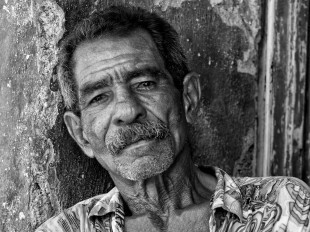 This gentleman seemed to be eking out a living on the streets in Havana by selling roasted nuts. We couldn’t communicate but the camera and a small tip told him what I wanted. 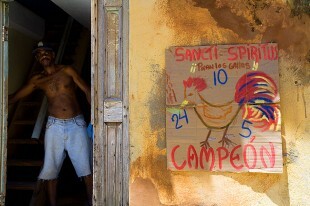 There was something about this gentleman sitting at the side of the road in Vinales. 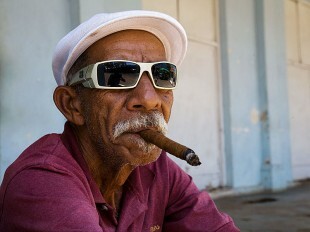 I think it was the mix of the white cap, designer sunglasses and the big cigar with that wizened face that prompted me to indicate to him that I wanted to take his photograph. He was quite willing to pose. As in the UK, many marriages happen at weekends and then all the couples seem to descend on the main squares in Havana to be photographed. This was one such couple. There are a few shoe shines on the streets in Havana. I liked the simplicity of this shot though I worked on it a little in Photoshop to make the colours a little more pastel and to bring out a little more detail – grittiness if you like. It seems to have given the image a pen-and-ink artistic feel which I find quite pleasing. I saw this gentleman smoking this cigar in a small park in the centre of Trinidad. I approached him and pointed to the camera suggesting that I might want to take a photograph or two. He nodded, and so I did. The background was somewhat cluttered and so I tidied it up. 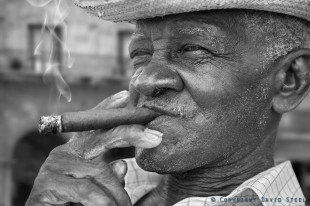 The cigar was not in the plane of focus and so was soft so I dropped in another cigar from a photo of a tobacco farmer. The finishing touch was to add a little smoke courtesy of Photoshop. 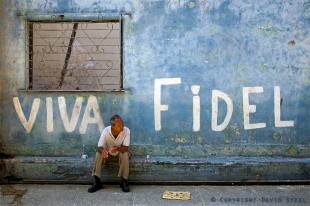 Taken in Havana in 2008, I waited a while and moved into position across the street. I like the colours on the wall and the graffiti and the man was just in the right spot. I had been looking for a shot like this all week and found this on the last day of the trip. 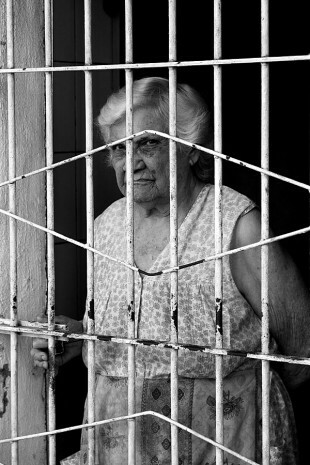 When Cuban girls reach 15 they are dressed up and photographed and/or videod looking their best. This girl was posing for the photographer in the cathedral square in downtown Havana and not wanting to miss an opportunity, I took some shots for myself.